In Japan, the land of symbolism, cherry blossoms are not just another pretty flower. They are a metaphor for life – beautiful, but lasting only a fleeting moment in time. The delicate petals, so lovely in spring, will fall within a week’s time, carried away by wind or rain. Fluttering like tiny birds, they sail from the trees to land as late spring snow upon the ground. Each year, the Cherry Blossom Festivals bring many people to the parks to view the blossoms, contemplate their meaning, and enjoy food and drink to celebrate the fullness of life. 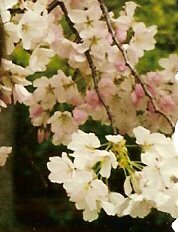 The book, Cherry Blossoms in Twilight, is a glance backwards, a reflection upon the life of an elderly woman. Her memories, both beautiful and painful, are held dear to her heart. Her past whispers in a voice only she can hear, beckoning to the child that still plays in the rice paddies and chases boats made of grass that float down the stream. Those memories bring alive the people and places she has loved, but to her children, those memories bring their mother alive, help them know who she is, help them know who they themselves are. This entry was posted in Cherry Blossoms in Twilight, memories. Bookmark the permalink.